Ideal for ledges, roof edges and ridges. Designed to change habits – not harm birds. Broadstairs Bird Control Services install seagull spikes for all homes and industrial, commercial premises in Kent. We are a bird control company in Broadstairs who are professional installers of seagull spikes and a range of other gull deterrents. 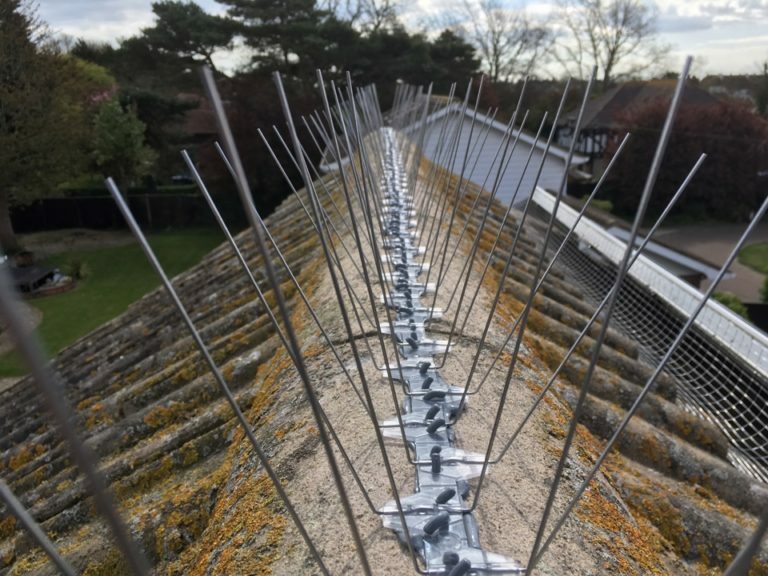 Like seagull netting, gull spikes are one of our most popular deterrents that we install as an effective measure against seagulls to stop them from perching on roof edges, window sills, building ledges and roofs. Gull spikes can also be used to protect chimneys from nesting gulls. We can install seagull spikes on any type of property covering large areas to protect your property from seagull problems. Seagull spikes differ from pigeon spikes in that they are slightly longer which prevents their longer legs from getting between the spikes. A tough bird generally commands a tough deterrent so we only fit long lasting stainless steel spikes. Seagull spikes do not cause harm to the birds.The tips of the spike are rounded. They are designed to deter birds and alter their habits. Spikes are an approved method of bird control deterrent. Gulls are a very destructive bird known for pecking at building materials such as waterproof membranes, lagging and roof materials. Common nesting areas include flat roofs on both domestic and commercial properties and behind chimneys or in between pots. Gulls become very noisy around March to April as they compete for territory. We would recommend deterrents are installed as soon as you discover activity. Installing gull spikes in Broadstairs. Bird spikes can be combined with other deterrents for maximum protection.